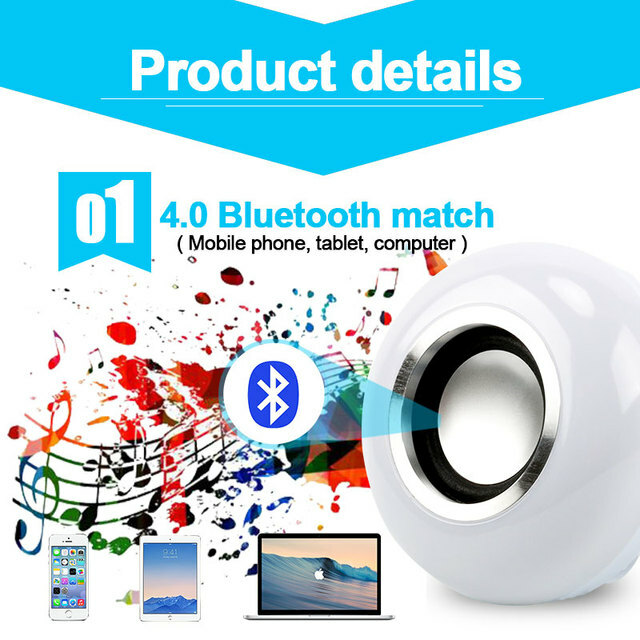 Voltage: 100-240V/50-60Hz Power: 12W LED Power: 7W RGB Power: 7W The speaker power: 3W Frequency reponse: 135Hz to 15Khz Wireless version: 4.0 Support configuration: A2DP Radio range: 10m (33ft) LED light color: White or Warm white Wireless Bulb Instruction The steps to use this led music bulb: 1. 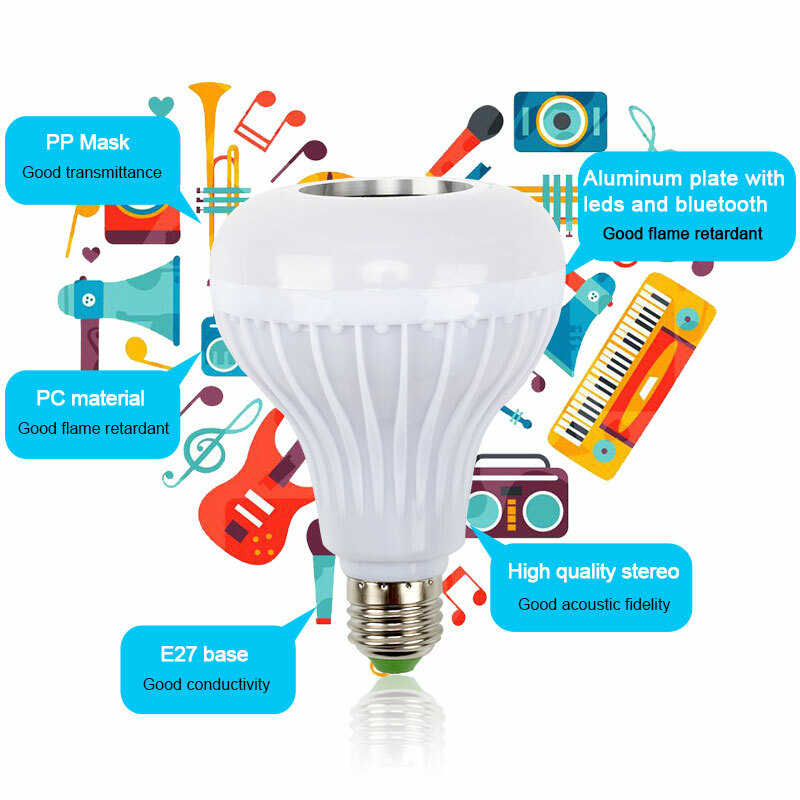 Applied this bulb to the E27 base, and then power the bulb. 2. 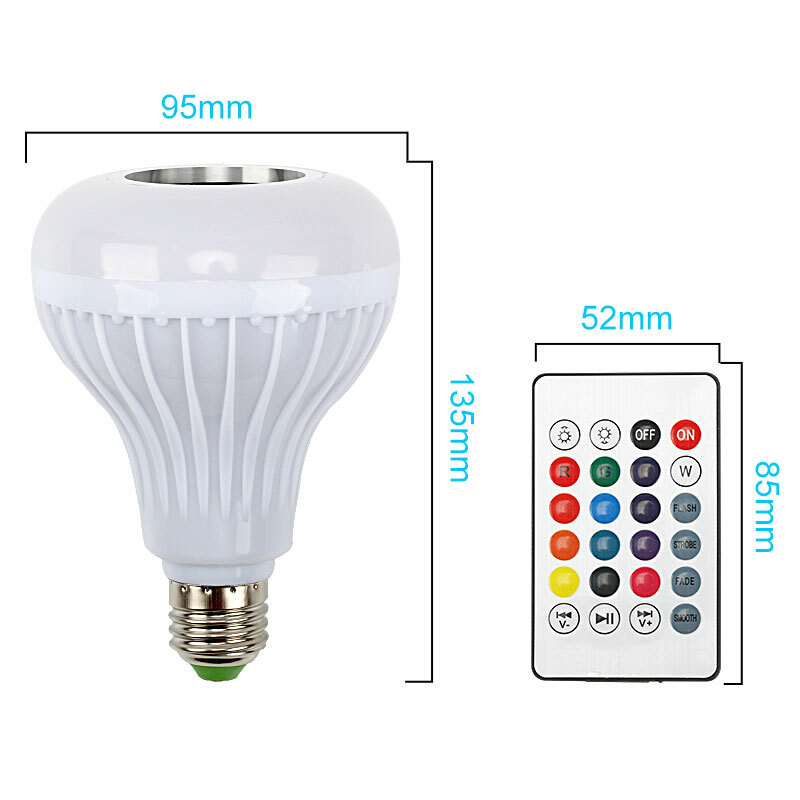 The bulb is lit up, then you can use the remote control to adjust the light color. 3. Turn on your bluetooth device (your phone etc. ), search and connect to the bulb. 4. 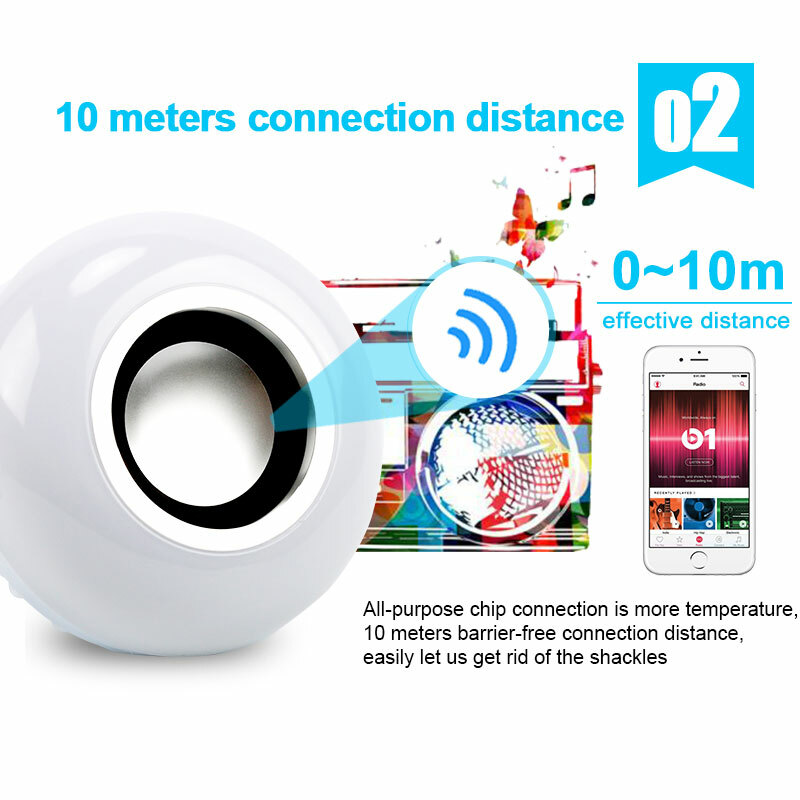 Connected successfully, now you can play the music you like with the bulb. Product Notes: 1. Please confirm the voltage first. 2. Please check the specification of the product carefully before ordering to insure a proper fit. 3. Do not disassemble any bulbs by yourself. 4. Be sure to cut the power off before beginning installation to avoid personal injury. 5. The bulb can be turned off by the remote control, and you can still use it as a speaker. 6. 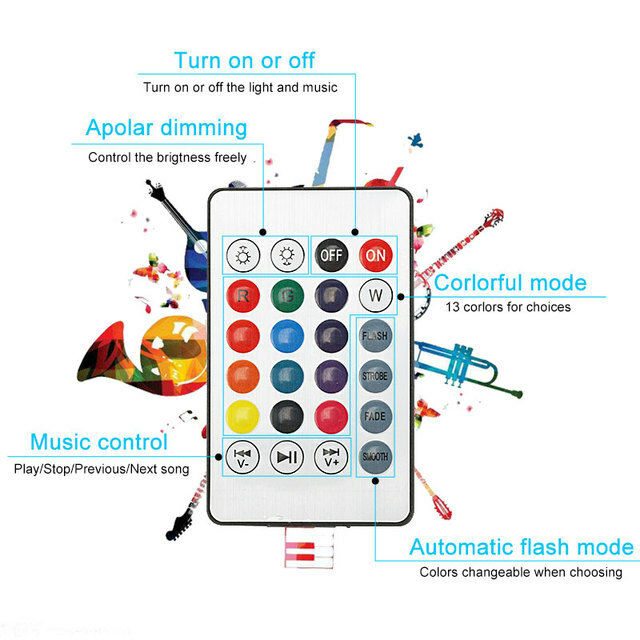 One remote controller can control multi bulbs (the light), but one bulb can only be connected to one bluetooth device (output sound). Application: Suitable for the bedroom, closet, cabinet, corridor, workshop, basement, garage, stairwell, oil depots, roof, door and other places. Package includes: 1x 12W Bluetooth speaker LED bulb 1x User manual 1x Remote controller (CR2032 Battery is not included) NOTE: PLEASE DON'T INSTALL THE BULBS IN HUMID ENVIRONMENT!